Northwest performances; 100 national & international press contacts serviced; Service to 300 jazz stations including Jazzweek reporting stations; Service print & internet jazz magazines. With an artistic hand lent by legendary bassist David Friesen, clarinetist Edgar Steinitz presents a soulful debut recording. Honoring his heritage, Steinitz taps into a deep spirituality inspired by the joyous melodies of traditional Ashkenazi and Sephardic Jewish music, offering originals and improvisations in their spirit. 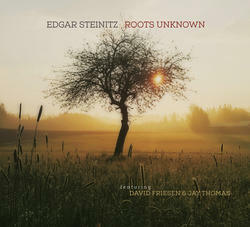 Besides Friesen on bass, "Roots Unknown" features an ensemble of accordion, violin, and percussion along with master improviser, trumpeter and saxophonist Jay Thomas. Combining the refined musical tastes of the Northern European Ashkenazi, and the strong Afro-Latin influences from the Northern African and South American Sephardic communities, Steinitz discovers a rich and significant musical landscape to explore.